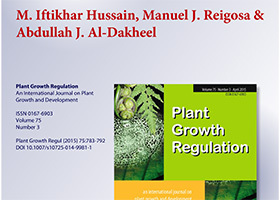 The present study was conducted to evaluate the role of natural compound p-hydroxybenzoic acid (pHBA) on physiological, biochemical and isotopic responses of Dactylis glomerata L. Application of pHBA in the range 0.5–1.5 mM reduced the leaf fresh/dry biomass, shoot/root length, relative water content and leaf osmotic potential of D. glomerata. pHBA decreased the photosynthetic efficiency and quantum yield of photosystem II photochemistry in D. glomerata seedlings following treatment at all concentrations. Photochemical and nonphotochemical fluorescence quenching were reduced after treatment with 1.5 mM pHBA. Carbon isotope composition ratio in D. glomerata leaves was significantly less negative following treatment with pHBA than the control. Carbon isotope discrimination value was declined by pHBA. The leaf protein content was lower after treatment with 1.5 mM pHBA. Our results suggest that pHBA possesses allelopathic potential against D. glomerata and this study provide new insights into the physiological, biochemical and isotopic action mechanism of pHBA.